Touchet River downstream of Hofer Dam. 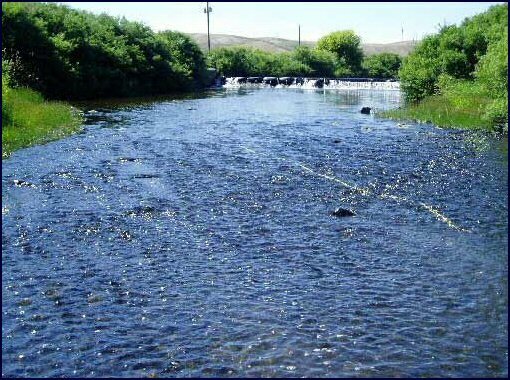 The Touchet river is one of the best trout and Steelhead fishing river in eastern Washington. The Touchet is also rich with Bass, catfish, and Walleye but when it comes to Steelhead the Touchet is the place to be. The Touchet is also one of the few river that offers a bag limit of three hatchery Steelhead per day. Be aware that most of the lower Touchet is private land but there si ample access at many of the bridges. Check with property owners before trespassing to avoid trouble. See our Touchet river fishing access map below. The Touchet is only open to fishing for a few months on the year but from November till mid April the Touchet is open to Steelhead fishing. This fishery generally allows 3 steelhead per day. Top Recommendation for this location is fly fishing or drifting eggs under a bobber. Next possibly a stealhead jig, or corky and yarn and lastly spinners. No man’s land except for the occasional cow! Eye still protection recommended!